With no secondary school on Hoy it has been difficult to identify a means of interacting with the teen age bracket of the community. In an effort to explore the potential of wartime heritage as an educational device for secondary school pupil’s, contact was made with OIC’s outdoor education team who carry out a wide variety of outdoor activities with school groups visiting Hoy from Mainland. 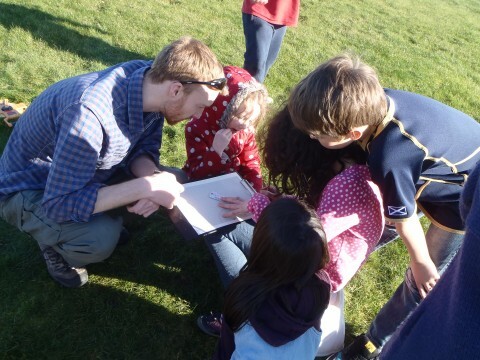 With full co-operation from the outdoor education team, a GPS based orienteering exercise was created which could be delivered by the OIC Outdoor Education as part of their orienteering programme. The exercise was based on the globally popular GPS game known as Geocaching which involves the seeking of containers hidden at predetermined grid coordinates. The boxes normally contain a logbook or log sheet for discoverers to record that they have found the cache and sometimes ‘treasure’ objects which can be retained by the finder on the condition that they leave something in their place for the next person. 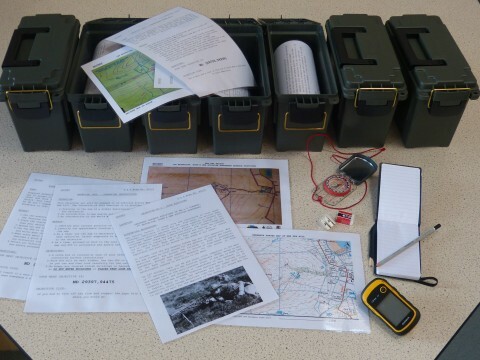 The geocache orienteering exercise was a variation on this theme and consisted of seven weatherproof plastic ammunition-style boxes being located at wartime archaeological sites previously identified on Wee Fea during the fieldwork programme. 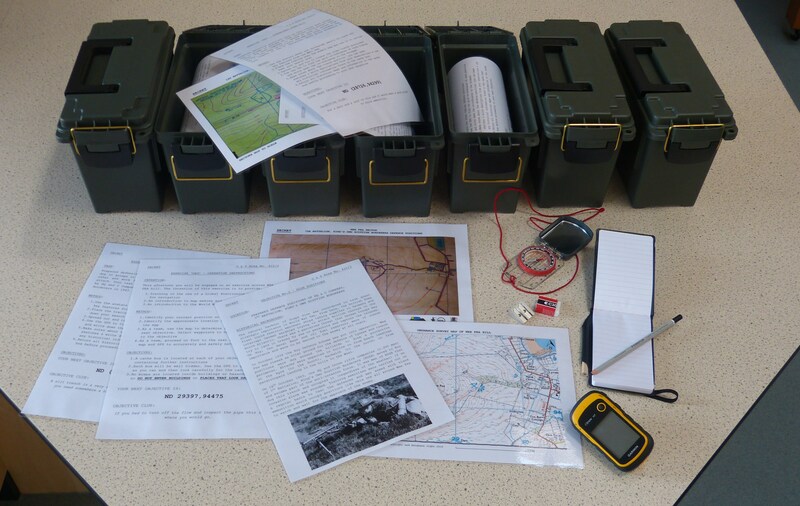 Each cache box had laminated interpretive material placed inside which relating to the wartime site on which it was located and two of the boxes also contained mapping exercises to encourage the outdoor groups to seek out other wartime sites nearby and record their location (Figure 19). 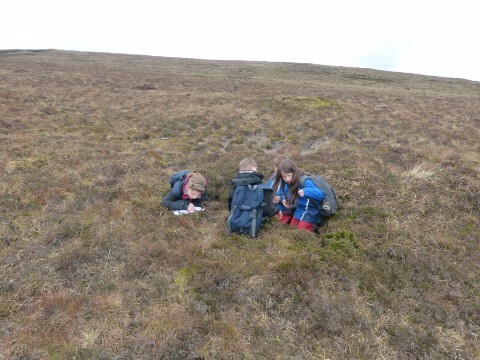 Pupils of Papdale Primary School recording their discovery of one of the defensive fighting positions on the geocache orienteering trail. On Thursday 8th May the boxes were installed on Wee Fea and the following morning the trail was tested by a visiting primary 6 class from Papdale Primary School. The pupils were below the secondary school age that the exercise was pitched at and they had not undergone map and compass training ahead of time but with a little more staff support than originally planned, they were able to carrying out the exercise. Upon arrival at a prearranged position half way up the hill road, the outdoor group was disembarked from their transport and were issued with ‘sealed orders’ that introduced the exercise and provided them with the grid coordinates of the first cache box. Each subsequent box contained the coordinates for the next box and by using maps, compasses and GPS’s the groups moved around the trail before returning to the point of origin for collection. 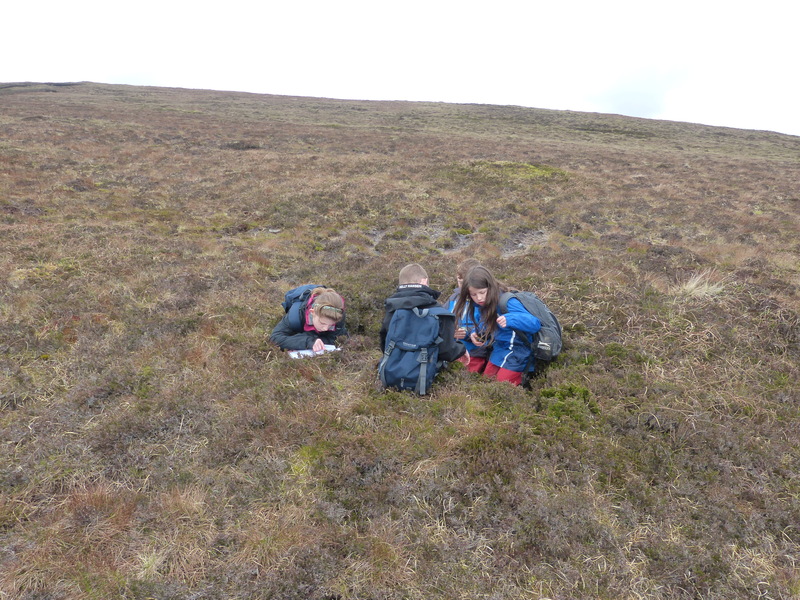 Owing to additional time being required at the beginning of the exercise to teach the primary 6 pupils rudimentary map reading skills, it was not possible to complete the whole trail within the allotted activity time period and only two out of the seven boxes were utilised. In spite of this, the pupils remained engaged and focused on task for the duration of the exercise and demonstrated a high level of ability in being able to undertake such a challenging task. At both of the cache locations the pupils participated in reading aloud the interpretive material which generated interesting discussion and questions about ‘what it must have been like to be a soldier sitting in a small, wet hole half way up a hill watching and waiting for the enemy.’ Observations carried out during the exercise and conversations with school and outdoor education staff afterwards would indicate that the wartime geocache trail provided a positive and effective means of engaging young people with WWII history in a real and tangible way. 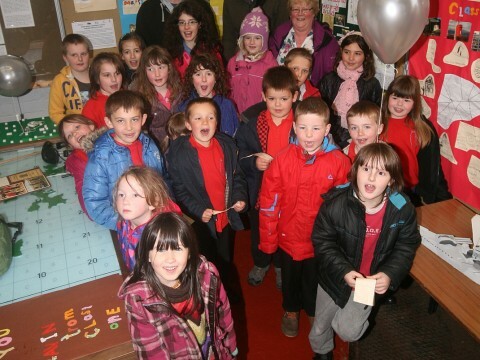 The trail has been left in-situ on Wee Fea as the OIC Outdoor Education have indicated a keen interest in making further use of it in the future. 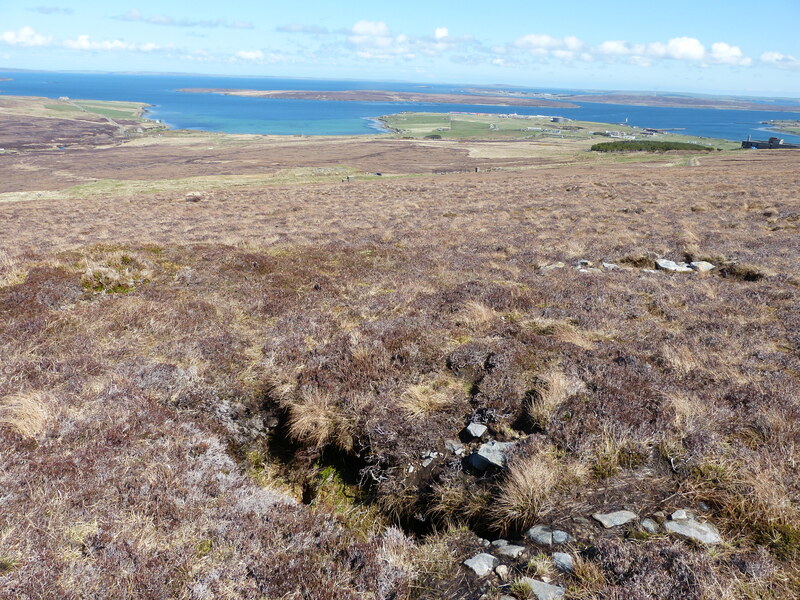 Interest in the trail by local geocache enthusiasts has highlighted the potential of wartime heritage geocache trails as a means of encouraging tourist and local engagement with more remote wartime heritage sites on Hoy. The orienteering exercise has therefore been developed into a multicache geotrail available to the wider geocaching community via www.geocaching.com. The launch of the trail has occurred too late in the project to gather any data regarding its success in this respect but its potential as a low cost, low maintenance interpretation resource which could encourage a new type of tourist to Hoy is very high indeed. 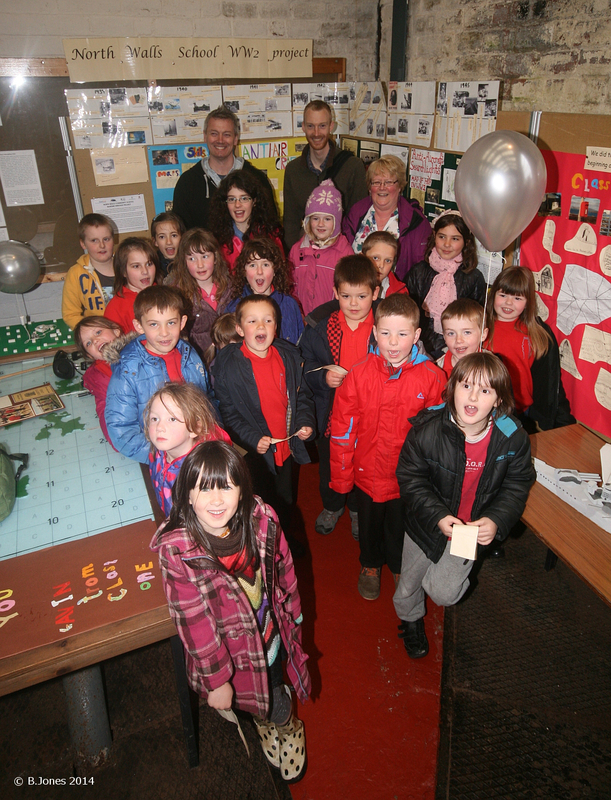 If you are involved in running or organising outdoor activities for young people aged 11 and up then why not give the IoHDT Wartime Heritage Orienteering Trail a go. There are instructions for organisers along with the ‘sealed orders’ to issue your group available to download below.